CytoDyn Inc. (CYDY) is working on the next generation of HIV drug that is more elegant in its mechanism of action than existing drugs and can boast a stellar safety profile. In its quest to develop its HIV candidate, PRO 140, stumbled on multiple uses of the drug with remarkable preclinical data that turns this drug into a powerful CCR5 targeting platform technology. Awareness of this drug has been stunted since its development by ProgenicsPharmaceuticals(PGNX)in the late 1990’s close to the height of the AIDS epidemic when the founder of this technology tested this product on over 100 patients with this antibody safely and effectively. Studies at that time proved it was a potent HIV Inhibitor. Other more toxic CCR5 inhibitors like Maravirochave enjoyed FDA approval since 2007, while PRO 140’s development halted in 2010 at Progenics due to their new leadership and the company wanted to focus on their other cancer product which had impressive results. Notwithstanding, the slow development of PRO 140 at Progenics, the one constant truth is the efficacy of PRO 140 and its excellent safety profile had received favorable view from NIH (National Institute of Health), awarding the product over $28 million worth of grants. The development of PRO 140 under CytoDyn had been very impressive by completing one phase 2b and one pivotal Phase 3 and being in a position to file its final approval application, Biologic License Agreement ((BLA)) to the FDA for final approval, all in less than 5 years. However, the long wait for investors is reaching a climax. Specifically, the company announced it met it’s endpoints in a pivotal Phase 3 studywith little fanfare in February 2018. PRO 140 is not only for a salvage population, but also has potential for much more than that for HIV infection. Although the first Phase 3 BLA will be filed later this year for a salvage population of three class resistance or two class resistance plus limited treatment option, the next approval could be back to back for Monotherapy which is for a much larger population. Last year the company announced that the FDA rejected granting CytoDyn Orphan Drug Designation for a Deep salvage, HIV population, due to PRO 140 potential of being able to sell to over 200,000 patients post approval. The FDA rationale was that they believed CytoDyn is developing PRO 140 for monotherapy in parallel to salvage population which if combined could give it over 200,000 HIV patients post approval and therefore not fit the criteria of an orphan drug. CYDY has a $110 million market capitalization which is extremely undervalued on a number of metrics. A Phase 3 anti-HIV drug candidate that is safe with established therapeutic efficacy at suppressing HIV infectivity should be worth at least $1 billion or 1 times sales of the smallest HIV drug Genvoya by Gilead (GILD). The potential for HIV monotherapy isn’t remotely priced into the stock. On July 30, 3018 the company announced a 70% responders ratein monotherapy at the 525mg dosage. The FDA indicated they wanted to see a responder rate that would larger than what they had seen in the past. CytoDyn had indicated the past results were about 50% responders at the end of 12 week trial. However CytoDyn is not satisfy with just 70% responder’s rate which is large improvement over 50% but is going to even higher dose. The final cohort approved to take a 700 mg dosage the trial is on track to exceed the this rate. Besides, other possible clinical applications of PRO 140 include Graft versus host disease ((GvHD)) as well as cancer and MS.
AIDS is still considered at epidemic proportions. Since the start of the epidemic 70 millionhave been infected with HIV with 35 million deaths attributed to HIV. The global HIV population is estimated at 36.7 million people worldwide. Out of those diagnosed only 19.8 millionare taking antiviral drugs to manage their disease. The global HIV market is estimated to grow to$22.5 billionby 2025. The CDC has estimated that 1.2 millionpeople living in the United States are living with HIV. What is staggering is that 1 in 8 HIV infected person don’t even know they are infected. The standard of care ((SOC)) in the United States is called Highly Active Antiretroviral Therapy (HAART). This a cocktail of custom combinations of different drug classes of medicines that reduce the viral load in the body. 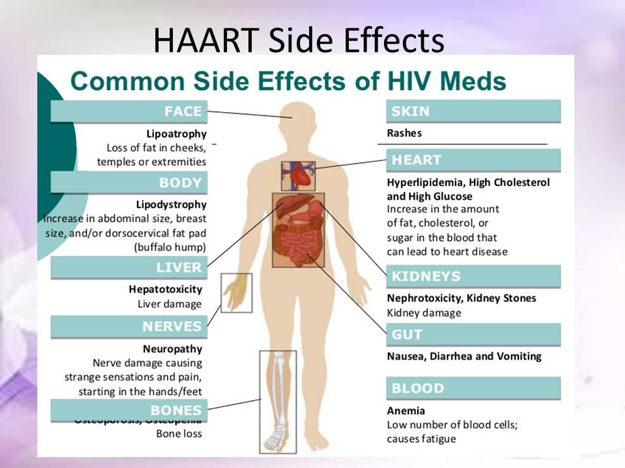 HAART is a maintenance therapy that cannot cure the HIV infection. All it can do is lower the viral load. Since the therapy involves oral medicines throughout the day it’s quite burdensome in addition to the toxic side effects from the antiretroviral medicine. Side effects include immune disorder, bone disorder, muscle disorders, liver dysfunction, and glucose abnormalities. New single pill a days are an improvement over multiple pills a day but single pill a day is not for everyone. Currently only less than 30% of HIV infected patients are on single pill a day. There are still a large number of patients that have unwanted side effects, high pill loads, inconvenient dosing and long-term toxicitiesare major drawbacks that contribute to poor compliance and the emergence of drug-resistant virus in many of these patients. Failure to complyleads to the disease rebounding in as little as 2 weeks. Disease management remainsa key issue. This is where a drug like PRO 140 is safer, has equivalent efficacy, and requires only weekly dosing. HAART cocktail is made up of antiretroviral drugs. The concept behind this drug cocktail is to target multiple stages of the virus’s cycle to prevent replication. Additionally, since it worked on different viral stages at the same time it also helped combat drug resistance. The chart below shows the 4 main classifications of drugs which include integrase inhibitors, protease inhibitors, nucleoside and nucleotide reverse transcriptase inhibitors ((NRTIs)), and non-nucleoside reverse transcriptase inhibitors ((NNRTIs)). While this cocktail works when adhered to it not hard to fathom from the graphic that the treatment looks more like a primordial soup of drugs that has been encrypted. Figuring out what to take and when to take the drug and which drug combinations are the most effective is an intimidating task. Generally, HIV patients take 2 NRTI’s and 1 NNRTI or a Protease Inhibitor. Some drug companies ended up selling a combination pill to simplify the process. The patients also have to take regular blood tests to determine the viral load. HAART is a real hassle and crimps a patient’s lifestyle. There has to be a better way! A new classification of drugs called entry inhibitors will be the focus of this article. The top-ten drug markers for HIV/AIDS with Gilead Sciences claiming the highest market share of any HIV drug make owning5 of the 10 top selling drugs was recently discussed. Gilead Sciences (NASDAQ: GILD) claims the highest market share of any HIV drugmaker. The biotech cash cow had eight HIV drugs selling in 2016 for a total of $12.8 billion. Truvada, one of these eight, is the worldwide best-selling HIV drug. Although GILD already has eight HIV drugs selling, a new one is looking poised to hit the market. A phase 3 study of bictegravir in combination with F/TAF (Descovey) will read out this year. Some analysts are projecting peak sales of $5 billion. Although Gilead’s growth has historically been a result of its success in the HIV market, recently its hepatitis C virus ((HCV))focus has been even more profitable. Last year, Gilead made $14.8 billion in revenues from its HCV drugs. However, HCV sales are falling significantly, mostly from the HVC population being treated so well. GILD now trades at about 9x forward earnings. Furthermore, people are speculating that Gilead will spend some of its large amount of cash to acquire a company that will strongly boost its earnings. While investors wait for that anticipated acquisition, Gilead pays them a strong dividend of 3.11%. Gilead Sciences is possibly a good investment at this time, considering its low valuation, strong dividend, and potential increase in earnings through an acquisition. GlaxoSmithKline’s (NYSE: GSX) HIV treatments, Triumeq and Tivicay, together generated sales of almost $3.4 billion in 2016, more than twice the drugs’ sales the year before. HIV is GSK’s most rapidly growing pharmaceutical business, even thoughthey still make much of their total sales from the respiratory related drug franchise. GlaxoSmithKline also benefits very much from solid growth in its vaccines and consumer healthcare divisions. GSK also has a few pending products in the regulatory process that could boost its earnings: Shingrix, the shingles vaccine, and rheumatoid arthritis treatment, sirukumab. Also, GlaxoSmithKline’s pipeline is comprised of a few other HIV treatments in late-stage development, two respiratory disease drugs and an assortment of drugs in earlier stages for rare diseases. The company is much more reasonably valued than its TTM P/E of 91 indicates. GSK currently trades at less than 15x forward earnings and pays a hefty dividend of 4.77%. Merck (NYSE: MRK), on the other hand has only one HIV drug, Isentress, which generated sales of almost $1.5 billion in 2016, which is impressive. Those sales, however, were an unfortunate drop from 2015 sales of just over $1.5 billion. MRK is attempting to rejuvenate its prior success in the HIV market with a clinical stage drug candidate, doravirine. The company released positive results from a phase 3 study of the drug in February, while two other late-stage studies of the drug are in progress. Regardless, Merck’s flagship franchise as of late has been its extremely successful cancer drug, Keytruda. The drug brought in $1.4 billion in revenues last year, which is impressive to begin with, but the key is that the $1.4 billion is just a drop in the bucket compared to its potential sales, which are projected to reach $8 billion. Currently, MRK is trading around 15x forward earnings and yields a dividend of about 2.95%. PRO 140 is ahumanized monoclonal antibody to chemokine receptor, CCR5, located on T-Cells. 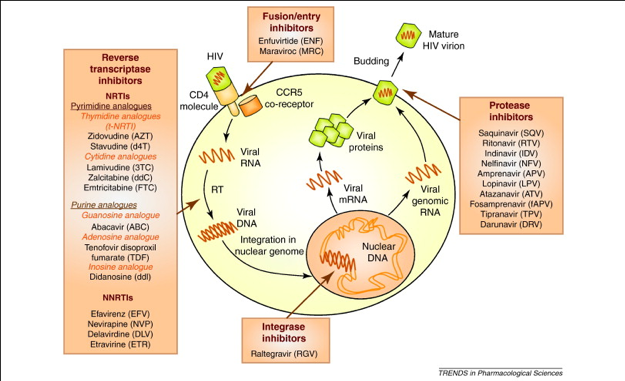 For more detailed information of the seminal discoveries depicting a critical role for CCR5 in HIV/AIDS pathophysiology, see Seeking Alpha article. PRO 140 has had extensive testing completing 7 clinical trials over the past decade. It works by blocking the CCR5 receptor needed by the HIV virus to bind and infect the host cell. It has an excellent safety profile for a monoclonal antibody with NO SAE’s related to PRO 140 in over 400 patients across 8 clinical trials. PRO 140 hasa terminal half-life of 3.4 days whichallows the patient a convenient once a week flexible dosing regimen with a simple subcutaneous injection with a syringe. The ease of use positions it as a monumental lifestyle changing drug. Additionally, the data showed that patients on monotherapy had no drug resistance at the 24 month point versus 76% of patients who developed resistance to 1 or more drugs in HAART. Equally important is the negligible toxic effects of PRO 140 relative to HAART. What makes PRO 140 so unique is its mechanism of action. PRO 140 binds to the CCR5 receptor on the T-cell in such a way that it prevents the HIV virus from activating the T-cells signal to open the cell membranes. PRO 140 is defined as a competitive inhibitor. The manner in which PRO 140 binds to CCR5 preserves its normal immune functionalityand its ability to fight infectionsassociated with suppressed HIV infection. In contrast to PRO 140, Maraviroc, binds to the CCR5 structure and morphs the shape of the binding site it to prevent the virus from entering. The morphing also affects the normal function of the CCR5 and does not allow chemokines to pass through. There are unknown long term consequences for blocking the CCR5 since CCR5∆32individuals have healthy lives without the CCR5 receptor. 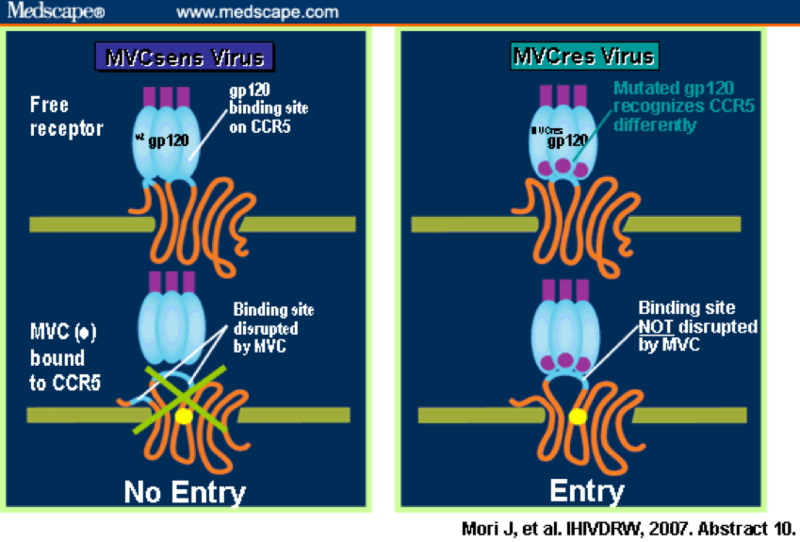 Another issue with Mariviroc is that the virus has been known to mutate and recognize the CCR5 target differently and allow entry in spite of the drug. Tolerability, safety, pharmacokinetics and efficacy of PRO 140 wasgenerated in multiple clinical trials validating PRO 140 as an effective and safe CCR5 inhibitor for HIV infection. Specifically, Jacobson and colleagues reportedin Phases 1 and 2a trials that a single intravenous infusion of PRO 140 as a monotherapy (i.e. in the absence of HAART) caused a dose-dependent effective antiviral responses that was fast-acting with mean reductions in viral loads (i.e. HIV RNA level log10) of 0.58, 1.20 (P<0.0002) and 1.83 (P<0.0001) for the 0.5-, 2-, and 5-mg/kg dose groups, respectively, relative to placebo group, with similar antiviral responses at a higher (10mg/kg; i.v). 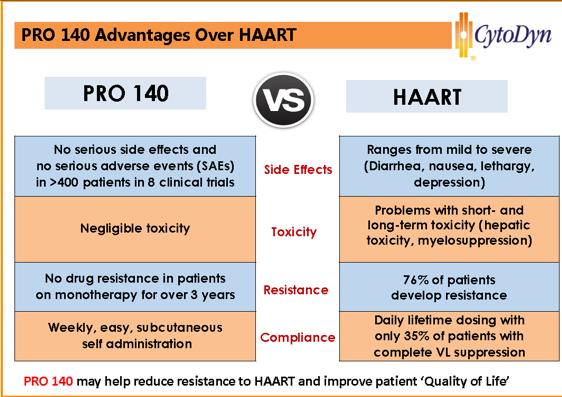 To negate potential limitations due to poor patient compliance, inconvenient dosing as seen with HAART therapy, a new formulation of PRO 140 was created that can be administered subcutaneously (i.e. under the skin). A Phase 2a monotherapy trial in HIV patients (Jacobsonet. al. J. Infect. Dis. 2010)using weekly (162 mg) or biweekly (324 mg) subcutaneous doses of PRO 140 demonstrated significant antiviral responses for all PRO 140 dose groups relative to placebo with dose-dependent mean reductions in viral loads (log10)) of0.23, 0.99, 1.37 and 1.65 for the placebo, 162mg weekly, 324mg biweekly and 324mg weekly groups, respectively. Viral loads remained suppressed between successive weekly and biweekly 324mg doses. No drug-related serious adverse eventsor dose-limiting toxicities were observed. This trial further validated PRO 140 to be an effective and long-acting antiretroviral agent for HIV infection irrespective of the route/method of administration. A pivotal Phase 3 trialin treatment-experienced HIV patients resistant to existing HAART regimen who were treated subcutaneously with PRO 140 in conjunction with HAART was recently completed. 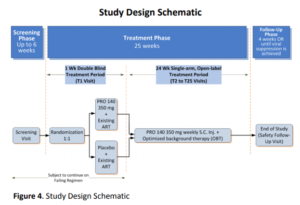 The Phase 3 trial design is composed of two parts: The 1stpartof the trial is the one-week, randomized, double-blind, placebo-controlled portion of the trial, in which all trial patients (n=52) received their existing failing HAART therapy, with one-half of the enrolled patients administered a 350mg subcutaneous injection of PRO 140 and the other half receiving a subcutaneous injection of placebo. 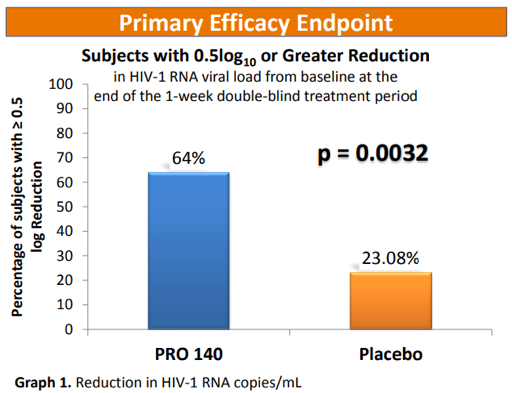 The trial achieved its primary endpoint with patients in the PRO 140 arm exhibiting a statistically significant (p= 0.0032) reduction in HIV RNA viral load of greater than 0.5log10 from baseline relative to patients in the placebo arm at one week. As per press release, of the 52 patients enrolled in the pivotal trial, 47 subjects completed the 25-week trial period. Of these, 40 patients requested to continue receiving PRO 140 weekly injections through participation in an extension study. Several of these patients have maintained viral load suppression with PRO 140 for more than two years. During the 25-week trial period on PRO 140, no patients experienced serious adverse events. Dr.Pourhassannoted that a small molecule CCR5 antagonist, Maraviroc, approved for a multidrug class HIV resistance population in 2007 showed a viral suppression rate of 48% after 48 weeks(Gulick et. al. NEJM, 2008; ), and the latest antibody therapeutic, Ibalizumab which has recently received approval for a multidrug class HIV resistance population achieved a 43% viral suppression rate after 24 weeks. Meanwhile, PRO 140, has 81% viral suppression rate after 24 weeks which is impressive improvement over the last two drugs approved for this population. He also noted that CytoDyn will pursue the first approval for PRO 140 as a combination therapy for HIV for multidrug class resistance with submission of a Biologics License Application to the FDA on a rolling basis planned to begin at the end of 2018. 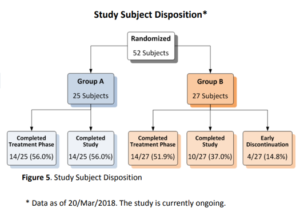 CytoDyn also has another Phase 3 trial which is investigative trial evaluating the potential use of PRO 140 in HIV patients for single agent maintenance therapy. In this trial patients were able to put away all their pills for the first time in their HIV lives and enjoy one dose per week of PRO 140. About two minutes per week and the injections are sub-cutaneous and is reported to be painless. The injections can be self-administered at home. This study evaluated the clinical efficacy, safety and tolerability parameters following substitution of combination antiretroviral therapy (i.e. HAART/PRO 140) with weekly PRO 140 monotherapy. Consenting patients (n=300) were shifted from combination HAART/PRO 140 regimen to weekly PRO 140 (350 mg) monotherapy for 48 weeks. The primary outcome measure will be the proportion of participants who remain on PRO 140 monotherapy regimen at the end of week 48 without experiencing virologic failure. The patients who did not respond to this therapy, were able to move back to their original regimen without any loss of options on their therapy. The responders also will always have all their other options available to them if they choose to go back on pills. PRO 140 is effective only against HIV strains that use the CCR5 chemokine receptor for infectivity, hence, a viral tropism test is required, just like with Maraviroc, before treatment with PRO 140. The next step for this trial is to evaluate the efficacy of the higher dose of 700 mg which is one dose per week and initiate a pivotal label expansion trial in hope of filing BLA for second approval after the first approval in combination therapy. The availability of a fast-acting, safe, antiretroviral agent, PRO 140, with long half-life and convenient dosing would provide an additional therapeutic options, increase compliance and lower the incidence of HIV infection. My analysis of the research shows that there are important differences in the mechanisms of action between Maraviroc (competitive inhibitor) and PRO 140 (allostericinhibitor) that could allow the use of combined CCR5 antagonists to induce robust and synergistic effective antiviral responses in HIV patients. Notably, PRO 140 may also have therapeutic efficacy in individuals (drug resistant HIV)for whom Maraviroc no longer works. Although more information such as CD4(+)T cell counts is needed from the trial, my opinion is that this data more or less validates PRO 140 as the next potential FDA licensed 2ndCCR5 inhibitor for HIV therapy. 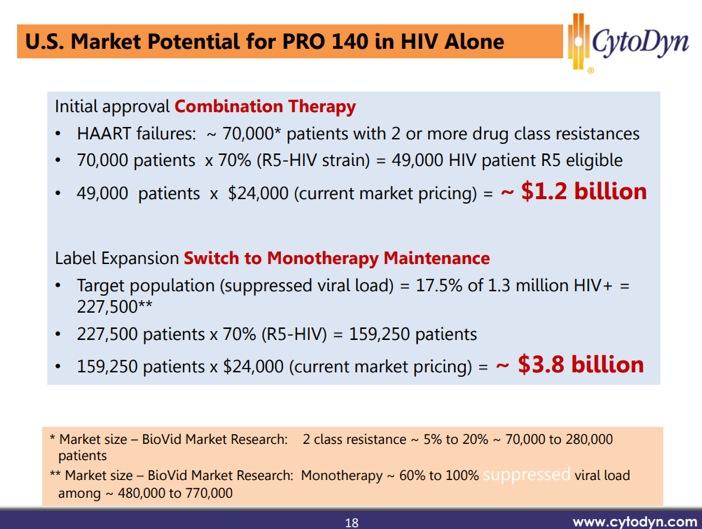 HIV therapeutics is an over $20 billion market and GILD alone has over $14 billionin the US and it is unimaginable if PRO 140 is not considered a game changer and a major player in HIV therapeutics following FDA approval. Other potential clinical application for PRO 140, a monoclonal antibody that targets the CCR5 receptor, includes Cancer and GvHD. CCR5 is a G-protein-coupled chemokine receptor that is expressed on immune cells [including NKT cells, NK cells, CD4(+)T cells], antigen-presenting cells (Dendritic cells and macrophages) and peripheral blood-derived CD34+ hematopoietic progenitor cells. CCR5 is also expressed on non-hematopoietic cells including endothelial cells, neurons, astrocytes, epithelial cells and vascular smooth muscle cells. CCR5 main ligands are CCL3/MIP-1α, CCL4/MIP-1β and CCL5/RANTES. Another studydone in Mexico supports use of the CCR5 antagonist in breast cancer patients as adjuvant therapy to block metastasis. In pancreatic cancer, CCR5 and CCL5 are significantly elevated in cancerous tissues. The study found that CCR5 expression may contribute to metastasis. A small exploratory trialin colon cancer using a CCR5 antagonist, Maraviroc, was encouraging because it killed the tumors, regresses the lung metastasis, and switched the tumor macrophages from pro-inflammation to tumor fighting. Other cancer trials are using combination therapy with a CCR5 antagonist in metastatic colon cancer, unresectable sarcoma, lymphoma, and Kaposi’s Sarcoma. 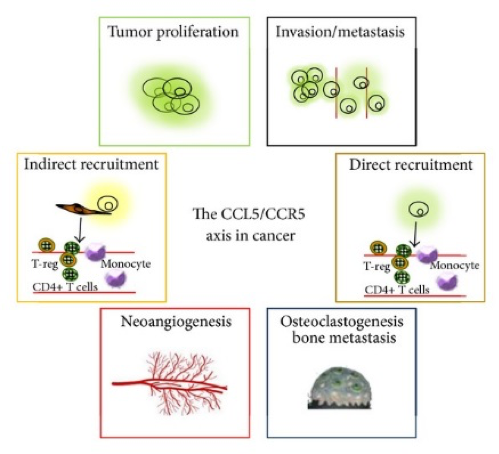 With all this activity, CCR5 is a viable cancer target especially in metastatic disease. GvHD is a complication of a tissue transplant from one person to the other and is commonly associated with stem cells in a bone marrow transplant. Sometimes the tissue in not a good match and the body recognizes it as foreign and attacks it. This condition is associated with increased mortality in patients undergoing hematopoietic stem cell transplantation((HSCT)) resulting from donor T cells activated by host antigen-presenting cells ((APCs)), and causing an inflammatory response and immune system disorders. Standard therapy is still problematic with steroids the mainstay and first line treatment and immunosuppressive drugs (mycophenolate mofetil)used as second line of therapy for steroid intolerant patients. Several pre-clinical and clinical studies have implicated T cells in the pathophysiology of GvHD. Furthermore, blockade of CCR5 chemokine receptor with Maraviroc has shown early promise in the clinic with reduced incidence of acute GvHD without increased risk of diseaserelapse. Pre-clinical studies in animal models of GvHD demonstrate that PRO 140 blocks CCR5 to prevent acute GvHD. When human cells (alien DNA to mice) are injected into another species the expected response from the immune system is to attack. In preclinical studies mice drop in their weight when injected with human transplanted cell. For mice to experience no reaction and actually gain weight indicates a breakthrough that could have implications well beyond stem cell implants and double as an anti-rejection treatment for organ transplants. 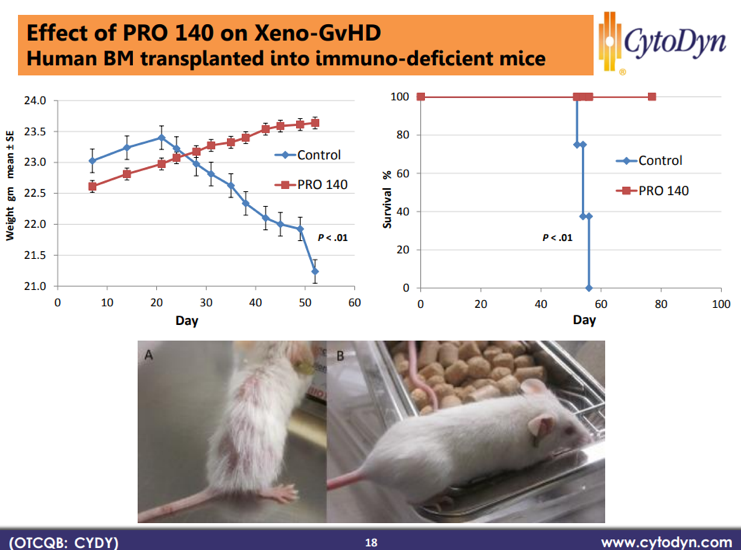 Since PRO 140 had such good safety data and the mouse model showed a complete resolution of GvHD, CYDY was granted orphan drug designation and was able to jump into a Phase 2 clinical trial. CYDY is currently enrolling up to 10 patients in a Phase 2 clinical trial to validate the therapeutic efficacy of PRO 140 in patients with GvHD. If the human response rate mimics the mouse study the trial will move along quickly and may not need to dose any more patients. Since development stage drug companies don’t produce any earning their valuations are primarily dependent upon the size of their total available market and some sort of penetration of that market. When a BLA is filed for an autoimmune disorder like arthritis there is historically an 86% probabilityof approval by the FDA. CYDY is about 6 months away from filing its complete BLA. PRO 140 as a combination therapy is expected to command a $1.2 billion market according to CYDY research. Assuming no other indications were in the pipeline an efficient market would price the company at a $860 million dollar market capitalization assuming an 83% market penetration of a $1.2 billion total available market. This represents the typical probability of approval multiplied by 1 X peak sales of $1.0 billion. Another way to look at this is that the market believes there is only a 14% probability of drug approval. Keep in mind there are no SAE’s related to PRO 140 in now over 500 patients and excellent efficacy data and no downside to approving the drug because if it doesn’t work patients can go back to HAART therapy. Investors need to evaluate why the market is doing such a terrible job discounting the probability of approval. 90% of drugs fail for safety. This one passed so the market is telling us that there is only a 4% chance that that this drug will be approved on efficacy. The monotherapy is very close to a regulatory endpoint and thus another indication. In that context of 2 possible approvals, the market is saying that there is only a 2% probability of efficacy in this drug. Whatever the forces holding the stock down the science screams that this is an approvable drug trading at a 72% discount to its probability adjusted value. The company has been steadily expanding R&D expenses from $15.1 million in 2015 to a record $38.2 million in 2018. They have 2 phase 3 trials and 1 phase 2 trial starting. The one phase 3 trial is coming to an end and the phase 2 trial for GvHD is set to enroll only 10 patients in the short term so R&D expenses should go down however the company will need to fund existing trials and get the BLA filing compiled which means they will need a significant amount of additional funding estimated at $15 million by their CMO. R&D expenses will increase significantly in preparation of the BLA. In the latest conference call the company said they preferred non-dilutive debt financing. Since 2015 shares have expanded from 58.4 million to 174.9 million at the end of FY 2018 (May 31, 2018) this represents the biggest risk in the company. CYDY only had $1.2 million in cash at the end of FY 2018. In a subsequent event the company raised $5.7 million via a convertible promissory note in a above the market offering at $.55. They had a steep increase in negative working capital to $13.4 million. SG&A has been relatively consistent over the past 3 years only increasing 3.6% to $7.34 million. There are currently 450 million shares authorized in the company. On June 7, 2018 at a special meeting of the shareholders the number of shares was expanded from 375 million to 450 million. On November 1, 2017 the company got approval to execute a reverse stock split at the board’s discretion before August 28, 2018. In the last conference call the CEO Nader Pourhassan, stated he was not at all in favor of a reverse stock split. Give the proximity to the expiration of this approval and the recent CEO guidance a reverse stock split doesn’t appear likely at all. There is a sizeable warrant overhang convertible into 128.9 million shares of common stock at varying prices. On the latest conference call the company suggested they were exploring options to potentially address this overhang but didn’t elaborate into any details. With the overhang of warrants, the low cash position, and the Accounts payable ballooning, there seems to be a significant financial risk in this stock. Should they be able to achieve a non-dilutive source of funds from a mezzanine lender to bridge the gap to commercialization the financial risk will evaporate making the stock relatively cheap if not a downright bargain basement price in its peer group. The last conference call alluded that they were in discussions with these type of lenders. Closing a non-dilutive round of financing is key in reducing the risk that the warrant overhang represents to stock price appreciation. Existing investors should also realize that should the price increase the company will have ample funding to get to commercialization. The primary risk in this stock has been the management team and lack of a consistent message. The recent changes at the board level seem refreshing as the company appears be executing a pivot in its strategy to highlight that they are a platform technology deserving of a much higher valuation. A corporate update wasn’t given for almost 7 months and brought up as a concern by an analyst in the last conference call. In the latest conference call CYDY went into detail about its plan to bring market awareness to the company and its new platform technology. Bringing Dr Richard G. Pestell on the board of directors and acquiring ProstaGene LLC.indicates a move in a new direction. Should this new pivot fail to resonate with investors then dilution is inevitable as the company needs to keep the clinical trials moving. There still remains a significant risk of dilution but it is limited. Aggregating the outstanding shares and the warrants the fully diluted share count is approximately 305 million. If the company were to max out the shares that would mean an additional 32% dilution. With the ProstaGene acquisition pending and some sort of share swap is being indicated to pay for the acquisition. In my opinionit seems like CYDY is using the strength of the acquisition target to raise money for its BLA filing and complete the acquisition. This is an informed opinion based on the updated milestones sectionof the CYDY presentation where two new IND’s for colon and breast cancer are planned. Institutional investors typically love multiple shots on approval and these highly developed indications with solid preclinical data reduce their risk and increase their expected return. So while there is risk of dilution management seems to be navigating this issue with a delicate balancing act between getting the acquisition done, shareholder dilution issues, and raising money. On the positive side of the risk column is the safety profile of their lead candidate PRO 140. Most drug approvals fail short for safety, but the combination therapy PRO 140 has achieved its endpoint and has no SAE’s making this candidate likely for FDA approval as there are no other treatment options for this segment of HIV patients. Efficacy results have been exceptional thought the clinical trial and represents the smallest risk. On the most conservative basis is appears that PRO 140 is on a likely trajectory toward FDA approval. They key obstacle is funding to complete the BLA estimated at $15 million for the CMC and a smaller amount to complete the clinical trials. The company appears to be working on funding in conjunction with the acquisition of ProstaGene which is the equivalent of the development of a new platform technology that is ready to have a phase 3 drug approved and then work on proving out multiple indications. On its own merits the valuation of ProstaGene is worth multiples of the current market cap of CYDY. With such a stellar safety profile, PRO 140 is poised to start multiple phase 2 trials for the indications of cancer, GvHD, and NASH. Although not mentioned earlier in the article, it’s noteworthy to mention that CYDY would be an ideal candidate for the top 3 HIV drug makers because should they get a monotherapy designation, they could upset the entire HIV marketplace which is based on HAART as its standard of care. The focus of this article is the CCR5 platform technology and its wide reaching applications should this drug garner FDA approval as a combination therapy. Investors should key in on the fact that this is a powerful CCR5 targeting platform that met its primary endpoint in a pivotal Phase 3 studythat could be branded a lifestyle drug. There are many catalysts mentioned that could boost the stock in the short and long run. The valuation of the combination company with ProstGene is bordering on ridiculous as its fully diluted market cap represents under $150 million. With 4 potential indications in cancer (mentioned above) starting at a phase 2 with the ProstaGene acquisition it seems unlikely that a long term institutional investor would unable to recognize the true value of the company and want to fund it properly. An institutional investor funding CYDY now would be investing in four phase 2 cancer indications and GvHD and get the potential revenue from combination therapy likely to exceed $1.0 billion in the coming year and the blockbuster potential of a HIV monotherapy that would displace the entire HIV standard of care and lead to a bidding war for this drug in the coming year. The stock seems undervalued on many metrics and any market exposure could result significant market appreciation.